Hello, September! I'm so ready for fall to get here but in Arizona, it doesn't usually feel like fall until Winter is at our feet. We're still riding out the 100º+ degrees right now, at least the humidity is gone finally... it was a very humid summer for us, which you wouldn't think would be a thing being in the desert but we have a lot of monsoons through the summer. Ok, enough rambling about the weather, let's get to the cards! I'm using the same decks as last week since they paired up so well! The Collective Tarot and Numinous Tarot. I still need to get my review up on the Numinous Tarot, will do that this week! TLDR: Bring our attention to what is holding you down and dragging you through the mud. It's time to make peace so that you can move forward with an open heart! Last week we had a big "self care" notion, this week I'm getting a sense that we need to pull back a bit for some deeper introspection to help clear out anything we may be holding on to. Things that we keep burying every time they pop up. The Hermit is our theme this week! They look tired yet happy, and oh so out of it. We are being asked to really draw ourselves in a bit and for good reason. It's time work on the things we keep pushing back down to deal with later. The 3 of Bells asks that we pay attention to what is causing us hurt and ill feelings. We can ignore it all we want but it's not going away anytime soon unless we bring our attention to it like the Hermit asks. We are being asked to really take the time to recover from these things rather than cover it up or they will keep hanging on and holding us back. How do we do this? The 8 of Vials is reminding us that somethings are just not worth it and we need to learn how to release what is really doing us damage, not just cover it up! Acknowledge the pain and release it away mindfully. We can run from our issues all we want but they will always pop up and find us. It's best to take the time to really work with them rather than bury them further and further down. I love how both the Hermit and the person in the 8 of Vials are facing the 3 of Bells. It's as if they know what they need to do and are ready to shed light on what is holding us back or what we're still struggling to cope with. The person seen leaving the party in the 8 of Vials makes me think it's time to really give the 3 of Bells our full attention. This is not a long term thing, it's a very short passing so why not clear the clouds now and get it finally over with so you can move forward with a clear headspace and an open heart. I missed the weekly reading last week due to being swamped with some side projects, sorry folx! It's back this week and I'm using a new deck that I will be reviewing in a few days, it's the Numinous Tarot by Noel Arthur Heimpel... I'm in love! Full Moon in Pisces - Today we are looking at a full moon in Pisces! This moon relates to release in your spiritual path, high emotions, and trusting your intuition. I'm getting a big giant sign that reads "take care of yourself" in flashing neon lettering! Our theme this week is coming from the 4 of Feathers (4 of Swords) and it's all about retreat and rest so that you can tackle your projects more efficiently. It's hard to put out your best work when you are exhausted and mentally clocked out, take care of your headspace and give it some extra care this week. Be mindful in how you are spending your time and energy, these are indeed resources that are often looked over. The Lovers is popping up as potential energy this week and this says that we need to be there for others in our community, social circles, and families - this includes yourself! Showing up for yourself is a big one, I mean, how can we help and be there for others if we don't help ourselves. Right? It's like feeding others when you have no food at home for yourself, you need to include yourself in this group. The 5 of Tomes (5 of Coins) asks that we be resourceful and use what we have on hand, or if absolutely needed, seek out to those who can provide for us. There is no shame in asking for help when you need it, this is also why it's good to keep positive bonds with those around us. We can't always take, take, take... we need to give sometimes as well. If you can though, really try to do this yourself if at possible. Use what you have on hand before having to restock, get creative and get crafty even! You may just surprise yourself at how capable you truly are. Whether this comes to meal planning for the week, supplies for a project, or even just carving out the extra time you need... if there's a will, there's always a way! Overall, I get a strong sense of self care this week and surrounding yourself with those who support and love you. This reflects the Full Moon in Pisces very well I think! Do what you can and the rest will follow. I know I always say this, but I think I've finally found the perfect deck for myself! The Numinous Tarot. This deck has really impressed me way more than I had expected it to! I ordered this deck out of the blue after watching several YouTube reviews and fell in love instantly! I remember watching this deck come to life when it was being created a few years back. It caught my eye then but I never took the plunge to order it, not sure why I waited so long but I'm glad I have it now. The deck was originally launched on Kickstarter back in July of 2017 but the deck didn't officially come out until early 2018, so it's still a very new deck and one that needs to be talked about more! The Numinous Tarot was created, illustrated, and written by the talented Noel Arthur Heimpel. This deck is non-binary, queer, diverse and features different body types, race, abilities, and gender identities. In other words, it is simply amazing with a full spectrum! Noel put so much love and focus into creating these cards, I'm in awe of their talent. Not only is this a brightly colored deck, it's filled with symbols, down to earth imagery, and magic. This deck has combined some of my favorite features that I look for in a deck: cardstock, vibrant colors, gender fluid, and diversity. The more I deepen my tarot practice the more it evolves, over the last year or so I started to remove gender from my readings. This has literally changed my perspective when it comes to reading tarot for not only myself, but for others and the collective. This deck reflects these changes immensely! I recently shared a mini 8 card review on the Indie Deck Review, so I thought I would go into a little more detail here as to why some cards really resonate with me. I'm very drawn to the more shadow like cards, the ones that some would consider darker or more "negative". Despite being a very bright and happy looking deck, there are cards in this deck that really slap you in the face. While gentle, they still carry a big punch! I absolutely love the Bells (Swords) suit. My two favorite cards from this suit are the 4 of Bells and the 9 of Bells. The 9 of Bells pulls me right in and I can totally relate to how this card feels. When things are rough and stress is high, the volume of it can be really loud and non-stop - a literal feeling of all these thoughts hanging over your head. The 4 of Bells carries a sweet message but is a great reminder to slow down and take care of your headspace by getting some rest. Yes, work is stacked up but you won't be able to function well if you keep overworking, it's time to clock out for a moment and slow your mind. The Death card in this deck is amazing, you can see the eyes transforming on the face of the person. They are in the middle of a massive metamorphosis moment! Lastly, I treasure the crap out of the 10 of Candles (Wands)! From the colors all the way down to the weight being felt in this card really hits my core. I think many can relate to the feeling this card carries. I wasn't sure what to expect with the cardstock but it didn't let me down at all! I love the feeling of it, the cards do have some gloss to them but it's not overwhelming and I've had no issues with photographing them as you can see. I'm a lover of more thin and bendy cardstock, so this was perfect. Very bendy but durable! I would compare the cardstock to the Cosmos Tarot & Oracle deck set if you're familiar with that set. These cards are bendy and shuffle like a dream! Like I mentioned above, these cards remind me a lot of the Cosmos Tarot & Oracle deck as far as cardstock goes and it's the same with shuffling. I loved shuffling that deck and love shuffling this just the same! This deck came in a large box, which I think was to make it easier to stock on bookstore shelves, which makes sense. The box also houses the guidebook, which is equally large. I ordered directly from Noel themself and it arrived with a postcard print of the 8 of Candles (8 of Wands), a sticker of the Creator of Vials (Queen of Cups), business card, and the deck/box/guidebook. The box is sturdy as well. Everything was very well made and put together. The deck does come with an extra card in the Major Arcana, the Numinous. This card reminds me of "awe and wonder" when looking at nature or something that just really moves you. Something bigger than you. It resonates with my pantheist side big time and was a very quick connection for me! If you are looking for a diverse deck, this is it! The Numinous Tarot contains different races, genders, queer, abilities, body sizes, and the list goes on. Noel really did a fantastic job with creating this deck to resonate with people of all spectrums. 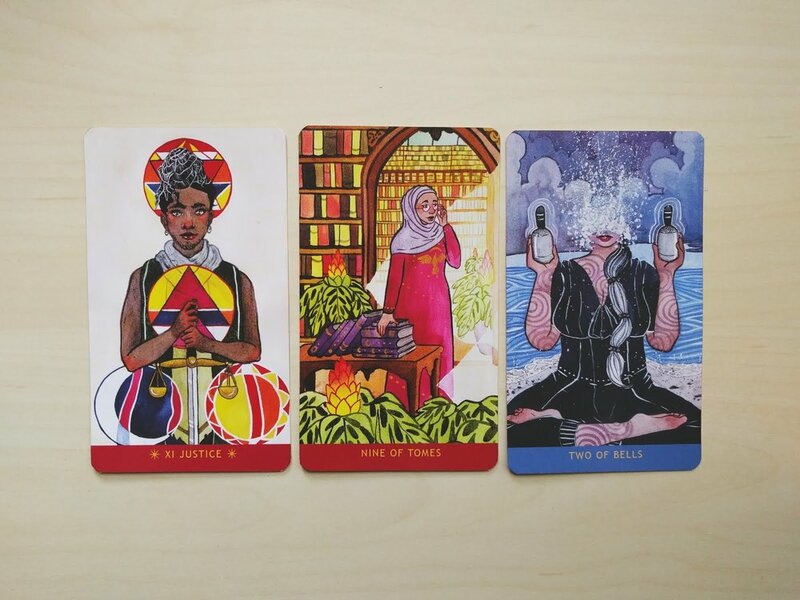 The 6 of Tomes (6 of Coins) is my absolute favorite card in this deck and it features a person with a body shape like mine, I adore this image! I wanted to talk about the guidebook simply because it's awesome! I rarely dive into guidebooks unless they have the artists perspective. This entire book was written by Noel themself. It contains their own Fool's Journey story, new spreads, info about the cards that aren't repeated from other books, and is just a really great guide! I love reading Noel's perspectives on the cards after I roll around with my own idea's and thoughts of the cards. I think it's pretty obvious, I love this deck! I would highly recommend this deck to anyone and everyone, it's perfect for new readers as well! In fact, if you are interested in tarot and just starting your journey then I would recommend 110% checking out this deck. I promise you that you'll love it! If you have this deck, how are you liking it? Or is it on your wishlist?